Upgrading from SCOM 2012 R2 to SCOM 2016 is theoretically no such big deal. BUT sometimes you could face issues at the customer’s infrastructure, which force you to take some extra hurdle. This post should give you a high level overview of different migration scenarios and additionally some pitfalls you could meet upgrading to SCOM 2016. There are 3 ways to upgrade a SCOM 2012 R2 environment. It takes usually a long time to finish this migration. There are 2 management groups to maintain. The amount of work to tune the management packs should not be underestimated. Dual-homing an agent could lead to some more stress on the agent server. Because you upgrade SCOM only, the operating system stays the same. Of course you could theoretically in-place upgrade the operating system as well, but I really don’t encourage you to do so. 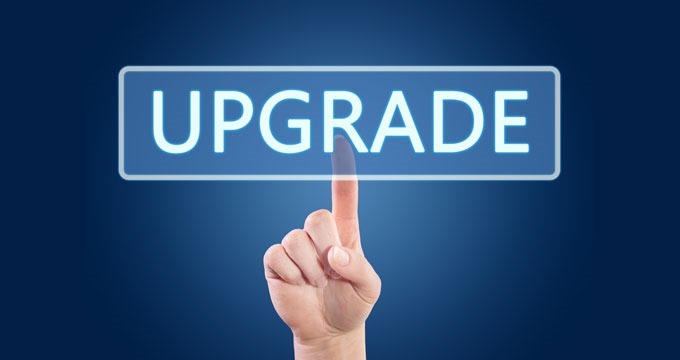 If you need to upgrade SCOM and the operating system as well, please check the next upgrade option. All your SCOM configurations bad or good will stay. If your management group is badly configured it will stay badly configured – an upgrade won’t change anything. You need to check if the management packs work with SCOM 2016, especially third party or community MP’s. Please ask the vendor BEFORE you start the upgrade. Make sure you meet the system requirements for SCOM 2016 . Remember there are also 3rd party connectors in SCOM which might are not supported by SCOM 2016. Switching the Windows / Linux agents or ACS Forwarders to the new management servers could take some time and depending on the amount of “clients” Step 3 needs to be planned carefully. If you don’t have the agents controlled by the SCOM Console you need to prepare some PowerShell scripts for moving the agents / ACS Forwarders to the new management servers. Remember to install certificates for Linux or Windows agents monitoring on the new management servers. Remember to set the SPNs for the new management servers. If you changed settings (Registry) on your old management servers, check if you need to make these settings on your new management servers as well. IMPORTANT: Test your migration scenario in a lab! I REALLY REALLY REALLY urge you to do so, if you don’t have a lab build one NOW! IMPORTANT: Make VM Snapshots of your entire management group BEFORE you start and DURING migration where it makes sense! This will save your a**! Apply SCOM 2016 UR3 immediately after upgrade. Depending on your scenario make sure you meet always the system requirements of SCOM 2012 R2 and SCOM 2016. This is very important if you are doing an in-place upgrade so all “old” components like SQL Server and operating system meet the SCOM 2016 requirements AND SCOM 2012 R2 requirements. Make sure you upgrade SCOM 2012 R2 to the latest UR before you upgrade. SCOM 2012 R2 agent (try to keep the latest UR!) 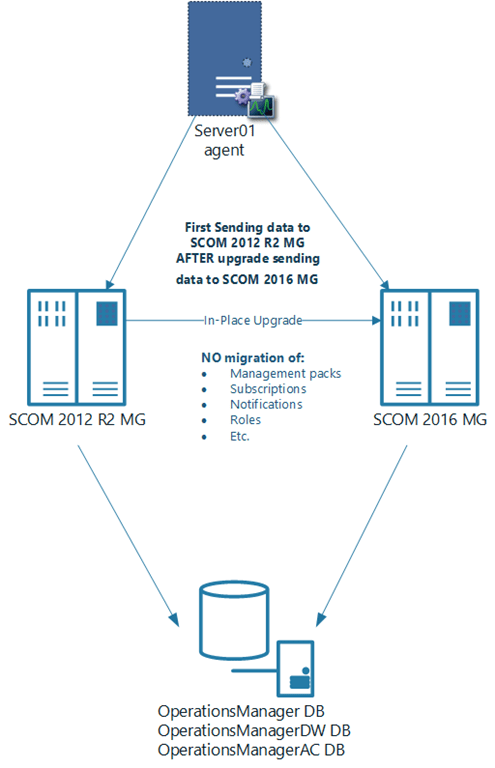 is forward compatible to communicate to SCOM 2016 MG, but also SCOM 2016 agent is backwards compatible with SCOM 2012 R2 MG.
Be aware that there are rewritten management packs available which you might want to consider to install in your SCOM 2016 environment, in case you have older versions in your SCOM 2012 R2 MG like Windows Server Active Directory (old: 6.0.8321.0 | new: 10.0.2.1) or Windows Server DNS (old: 6.0.7000.0 | new: 10.0.6.0 note: there is a known bug ) . If you install new MP’s that differ from your old environment, you need to check your overrides carefully! This article from MVP Cameron Fuller might help to understand the basic principle of overrides migration. Make sure your third-party management packs work with SCOM 2016, having a side-by-side migration let’s you easily test and deploy new management packs without interrupting the production SCOM 2012 R2 environment. Make sure you adapt your antivirus exclusion rules to SCOM 2016. If SCOM 2016 agent is grey on domain controllers check Kevin Holman’s post. Set the new SCOM 2016 registry tweeks after upgrade. If you click on the scheduling maintenance mode view in SCOM 2016 it will shoot an error. Apply this fix here. SCOM 2016 UR3 agent does still have an issue that it crashes the IIS Application Pool running .NET 2.0 runtime . I would recommend using SCOM 2012 R2 agent until this problem is fixed. 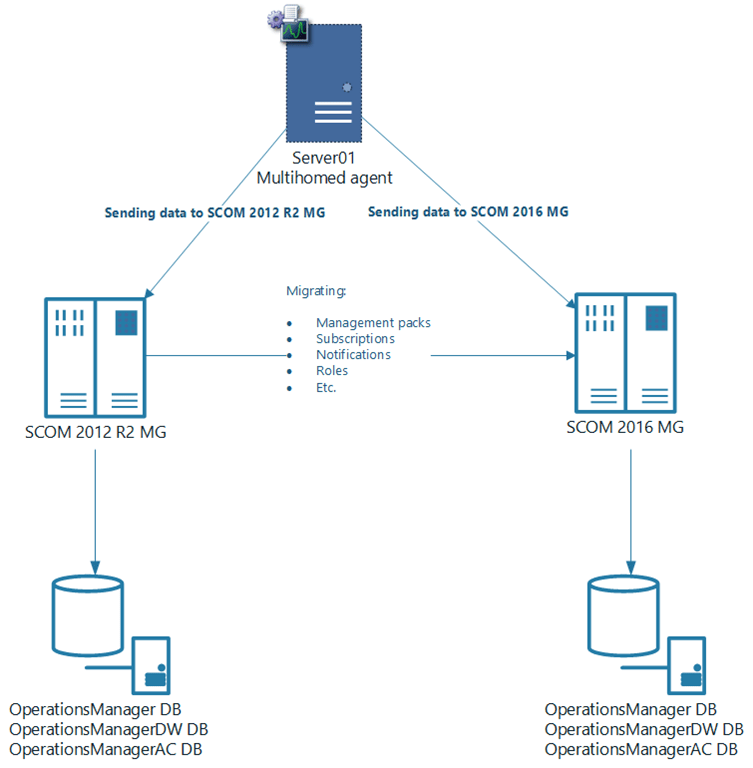 SCOM 2012 R2 agent is forward compatible with SCOM 2016 management group. MSI (s) (BC:F8) [14:18:59:579]: Product: Microsoft Monitoring Agent — The Microsoft Monitoring Agent cannot be installed on a computer on which the Operations Manager management server, gateway server, Operations console, operational database, web console, System Center Essentials, or System Center Service Manager is already installed. The Microsoft Monitoring Agent cannot be installed on a computer on which the Operations Manager management server, gateway server, Operations console, operational database, web console, System Center Essentials, or System Center Service Manager is already installed. Action ended 14:18:59: _AbortCoreComponentPresent. Return value 3. I experienced issues / failures if those software was installed and I ran the setup. 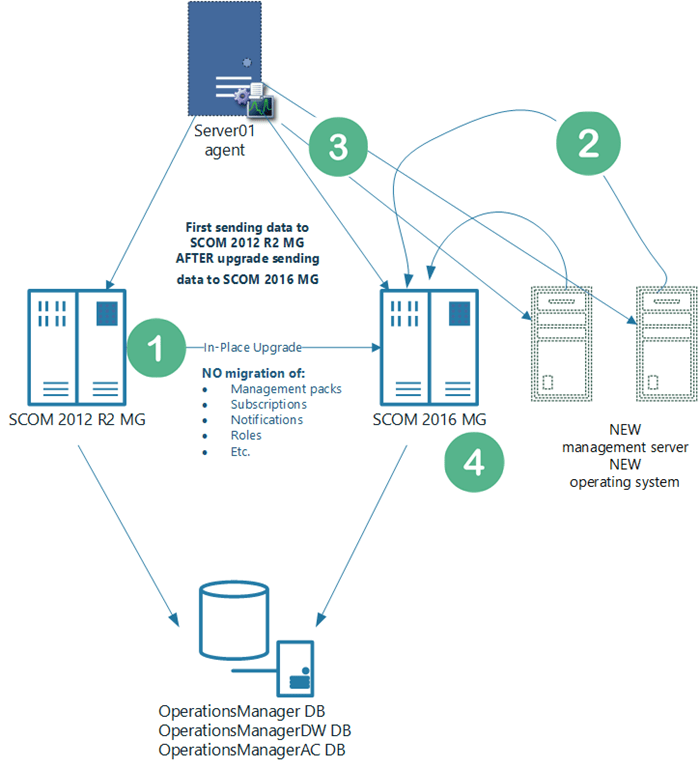 The high level migration scenarios are not meant to be a step-by-step guide, instead it should provide an overview how you could migrate to SCOM 2016. In addition this post is not a complete list of issues you could run into, but it should help you to avoid or troubleshoot certain issues. Thanks for sharing your experience. I am also planning the same. How can I migrate overrides and groups to new management group? Could you please refer me to any documentation? Please check the post from Cameron http://blogs.catapultsystems.com/cfuller/archive/2013/03/06/multi-homed-migrations-from-opsmgr-2007-r2-to-opsmgr-2012-and-overrides-scom-sysctr/ . If you migrate MP’s and you are having dualhoming in place for migration you just can export / import the MP’s. Thx for the information here. How do you upgrade and existing Management Group’s OpsDB and DW from Windows2012/SQL2012 to Windows 2016/SQL2016? Well the lowest common SQL version for SCOM 2012R2 and SCOM 2016 ist SQL Server 2012 SP3 https://docs.microsoft.com/en-us/system-center/scom/plan-sqlserver-design#sql-server-requirements . So you could install SQL SP3 and then upgrade the MG. After that you simply move the DB’s to a new Windows 2016 / SQL Server 2016 https://technet.microsoft.com/en-us/library/hh278848(v=sc.12).aspx this process is easy and works well. Thank so much Stefan. Just what I needed to know.